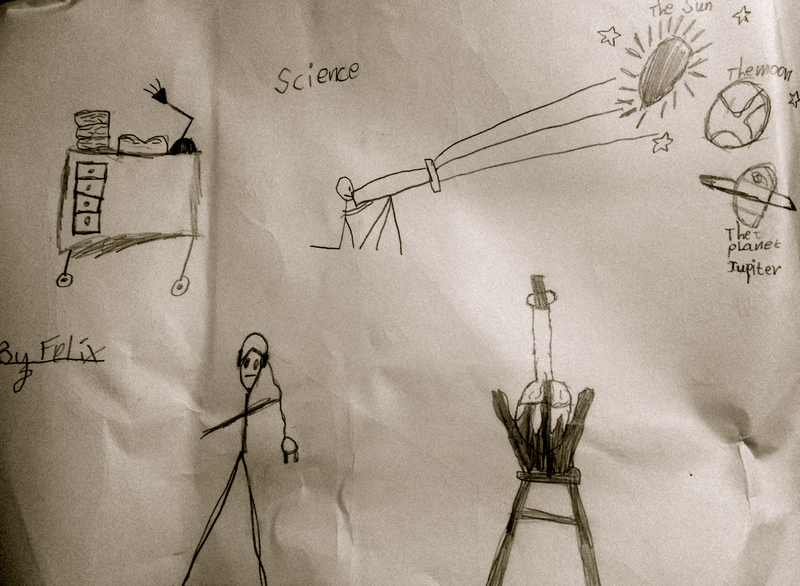 Felix’s illustration of scientists at work. I recently visited my nephew in London, a bright, lively 7 year old who loves being read to. He is, however, a little more reluctant to read himself and is uninspired by the limited “readers’ he is sent home with as practice. His conversation is entertaining; he plays with words, his vocabulary is rich and extensive. He is curious, creative and active. Yet recently a creeping erosion of confidence is seeping into his self perception as a reader. I listened to him read – a little hesitant and over reliant on sounding out words to limited avail…how does sounding out every letter help with words like ‘call’, or with a words like ‘one’ , ‘enough’ ,’people’? So much of reading involves being read to, being in an environment where reading is apparent and valued, all of which young Felix has in abundance. He has a sense of narrative, sees humour, irony, and can discuss the theme in the books and stories that are shared with him. Yet where I wonder, is he being taught to look for the orthographic structures that will help in both reading and writing? Where do we learn about the structure of words in our teacher training? I am continually reminded of this as I work with Grade 7 students and in discussion with teaching friends and colleagues also concerned about reading and writing ( Sharon Peters, Lyn Anderson, Imogen Whiting, Dan Allen, Skot Caldwell in the present tense, Skot Caldwell past tense, and Mary Beth Stevens).We see the importance of morphological knowledge for all students from high school to the very youngest of students. I too am aware of the importance of alerting young students to the ubiquity of digraphs and trigraphs in the structure of a base element. Developing awareness of orthographic structure , teaching spelling, real spelling, teaching handwriting, real script, is a critical element of teaching reading and writing. Focusing on a word and its morphological, etymological and phonological structure is providing students with the signposts they need when making sense of words on a page. What applies to one word will apply to hundreds. In conversation with Felix I asked what two words he really wanted to know how to read and write. What two words did he think were really important for children his age to know how to write and read? “Scientists and monsters “was his instant reply! Of course- these are critical words when you are seven and if like Felix you are a regular visitor of London’s Science and Natural History Museum. So here’s what we discussed about <science> and discovered about< scientists>. The word< scientists> has four morphemes: <sci+ent+ist+s>. The base element <sci> has 2 phonemes made up of three letters. Felix had not encountered the terms base element or suffixes, let alone phoneme or grapheme. However, this does not mean that he cannot be exposed to these terms and gradually use them. We discussed that every word has a base element , it’s the heart of a word and I explained to him that the bound base in this word was <sci>, it needed other morphemes to make sense. We discussed suffixes and the frequency of the plural suffix <-s> coming up with loads of examples. We also discussed <-ist> as a suffix and talked jobs: people who did things: as in a dentist, an orthodontist, an artist and an archeologist! At this stage I didn’t go into great detail about the suffix <-ent>, rather we focused on the base element <sci> and how the letters ‘s’ and ‘c’ formed a digraph<sc>, two letters working as a team to form the initial phoneme /s/ in the word <scientists>. When I asked Felix if he could think of any other words built around the base <sci>, Felix immediately identified <science> and quickly added <scientific> and <scientifically>. I told him that all these words had come from a Latin root :scire: to know, the language spoken by Romans hundreds of years ago. I also asked if he knew what it was to be unconscious, there was instant demonstration, prone on the floor, tongue lolling! We discussed that when you are alert and knowing, you are conscious and when you are unconscious you are unknowing. Here in these examples it is the base element that gives the meaning despite the difference of pronunciation of the base base element in the words conscious and science. Together we used mini matrix maker, with Felix typing in the word sums for these words with help from me. He was duly impressed when hitting ‘update’ to create the matrix and could then read many of the words contained therein. He certainly was aware of <sci> and at the end of this discussion and through the process of constructing the matrix and spelling aloud each morpheme as he added it to the matrix maker, he knew how to spell and write <science> and <scientists>. This was a first but productive step into the world of morphology and etymology. So what’s Felix gained in this brief session? has heard/been introduced to terms like base element, bound base element, morpheme– this has been reinforced through kinaesthetic movement ‘ s-c-i ‘(hands up) e-n-t (hands up) i-s-t’. So much of this knowledge builds up and accumulates rather than a ladder like approach of ‘teach’ the term, ‘test and retest’ for understanding. Immersion and continuous exposure builds understanding. Can you think of other words that share the base <sci>? To Felix, who had never heard of base elements, I asked the same question, but added can you build onto the word, add other suffixes, like we did with scientist and scientists? He came up with science and then scientific. It’s this process of making the connections in meaning from the early grades right through school that is critical. And here they are investigating the etymology of <scientist>. Intriguingly we know who coined this word< scientist>: the Rev. William Whewell- a Cambridge University polymath, as we discovered. Here’s what they wanted to share with Felix when they realized he had been working with the base <sci>. I’m sure Felix would be interested in Whewell coining the word scientist, hence my challenge to the students. I’d also thought if he watches this, it may reinforce some of the concepts and terms we covered in our brief discussion. We were also interested also by the word conscience, <con+sci+ence>. This word entered English early in the 13th century, perhaps before science via Old French where it meant innermost thoughts, desires,intentions. This had developed from Latin conscientia with a sense of knowledge of within oneself, sense of right. Hitchings discusses The Pricke of Conscience, a popular text in Middle English, existing in over 100 manuscripts which as he states ‘boosted the profile of conscience’ replacing the expressive Middle English word ‘inwit’, later revived by Joyce in Ulysses. Hitchings discusses how in Latin the word conscientia indicated abstract knowledge and in English how conscience acquires a sense of the mind, the moral faculty. By the 1350, the time The Pricke of Conscience had been written, its new meaning was entrenched indicating a ‘whole new dimension of English’ articulate about the inner world of thoughts and feelings.’ Another devotional manual of this period was written in Kent, Ayenbite of Inwyt (1340), literally the ‘again-biting of the inner wit’ , or the ‘Remorse of Conscience’ .The Pricke, of Conscience is, drawn from diverse books, but Dan Michel of Northgate’s Ayenbite of Inwyt is apparantly a literal translation of a French treatise, entitled Le somme des Vices et de Vertues. Again Joyce alludes to this in Ulysses breathing life again into ‘ayenbite‘ a literal English rendering of Latinate ‘remorse‘. And who exactly is Whewell? Whewell’s agility in mathmatics led to a scholarship to Trinity College in Cambridge in 1912. Not only mathmatically agile, he too appears to have been a dab hand with words winning the Chancellor’s Gold medal for poetry in 1814. Further success occurred when he became ‘second wrangler’. He later became fellow and tutor of his college, master and a professor of minerology and Professor of Philosophy (then called “moral theology and casuistical divinity”) from 1838 to 1855. He was childless, outlived two wives, and died falling from a horse in 1866! I am particularly amused by one of his contemporary’s statements about the Reverend Whewell: “science is his forte, omniscience is his foible”. Whewell’s title of ‘second wrangler’ and not of cattle, horses, argument or even as a wearer of a particular brand of jeans ( these being the only senses in which I was familiar with the word) was another fascinating discovery. Sense 1.a One who wrangles or quarrels; an angry or noisy disputer or arguer. ?1518 Cocke Lorelles Bote sig. B.iij, Here is gylys Fogeler of ayebery..With wallys the wrangler. b.One who engages in argument, debate, or controversy; a debater, disputant, or controversialist. 1561 T. Norton tr. J. Calvin Inst. Christian Relig. iv. xviii. f. 145v, Nowe least any wrangler shoulde stirre vs vp strife by reason of the names of sacrifice and sacrificing prest. c. The name for each of the candidates who have been placed in the first class in the mathematical tripos at Cambridge University. Sense 2.Western U.S. One who is in charge of a string of horses or ponies on a stock-farm; a herder. 3. Also Wrangler. A proprietary name for jeans. Freq. pl. orig. U.S. The senior wrangler is the student who gains the highest score, second wrangler being the student who gains second highest marks and indeed that was our polymath Whewell in 1816. To be awarded ‘ Senior Wrangler’ was considered “the greatest intellectual achievement attainable in Britain”. Many students in order to participate, needed to be coached like ‘racing thoroughbreds’. ‘Candidates typically sat for five and a half hours of exams every day for eight days—12 papers and 192 progressively more difficult questions in all. Those in contention for the title of Wrangler then sat for a further three days of examinations consisting of 63 still more testing problems. The most serious candidates invariably hired tutors and worked more or less round the clock for months. The historian Alex Craik notes that C.T. Simpson, who ranked as Second Wrangler in 1841, topped off his efforts by studying for 20 hours a day in the week before the exams and “almost broke down from over-exertion… found himself actually obliged to carry a supply of ether and other stimulants into the examinations in case of accidents.” James Wilson, who topped the rankings in 1859, had a nervous breakdown immediately after his exams; on his recovery he discovered he had forgotten all the math he ever knew except elementary algebra. And James Savage worked himself so hard that he was found dead of apoplexy in a ditch three months after being named Senior Wrangler of 1855.’ ( Smithsonian) Gruelling indeed! Apparently the outcome of the Tripos (named after three legged stools) involved much speculation and heavy betting. The term wrangler must have been familiar in 1890 when, shock and horror, the young and decidedly female Miss Phillipa Fawcett beat all males , scoring 13 % higher in the tripos in 1860! However, she was denied the title of Senior Wrangler, this title sacrosanct for males only until women were allowed to receive degrees at Cambridge from 1948 ( Oxford allowed this in 1920, Harvard allowed women in to medicine in 1945). Read more about the indomitable and intellectually intrepid Miss Fawcett here– no studying all through the night for our Phillipa with head shrouded in wet towels as was the inclination of her male colleagues… rather she followed “a disciplined and orderly life,” rising at 8 a.m. and rarely going to bed later than 11 p.m., studying a mere six hours a day. The student Philippa Fawcett in 1890. Although Cambridge allowed women to take the examinations, it did not allow them to be members of the University, nor to receive degrees until 1948! Therefore they could not be known as ‘Wranglers’, and were merely told how they had performed compared to the male candidates. Fawcett was declared to have finished “above the Senior Wrangler. The male undergraduates responded to the announcement with loud cheers and repeated calls to “Read Miss Fawcett’s name again.” Back at the college, “all the bells and gongs which could be found were rung,” there was an impromptu feast, bonfires were lit on the field hockey pitch, and Philippa was carried shoulder-high into the main hall—”with characteristic calmness,” Siklos notes, “marking herself ‘in’ on the board” as she swayed past. So what next for Felix? Where could we build on from here? I’d make sure he was clear about vowel letters and consonants- able to use kinaesthetic movement to name the vowel letters on his hand. This will help make clear to him that every word has a vowel letter and prepare him for recognizing vowel and consonant suffixes. We’d perhaps begin a list of words with <-ist> as a suffix, asking the family to add to them as he came across them. I’d talk to him about my discoveries about the word wrangler– Felix too is deft in the art of wrangling- he can come up with good arguments as to why he should be allowed to do various things, and I know he’d be interested in the idea of senior wrangler– top mathematician and second wrangler. Perhaps from here we could build a list of digraphs. We’d have :<sc> for /s/, <wr> as one of the ways for /r/, perhaps look at the trigraph <igh> for /ʌɪ/ as the free base element <sigh> is a homophone for the bound base <sci>. If we examined word <wrangler> we’d look at the suffix <-er> another agent suffix like<-ist>and continue to add to this list. Inevitably <-or> would come up and again we’d be on the look out for words containing this suffix. We’d certainly explore the <le> in wrangle and begin a collection and categorization of words where this final syllabic element occurs. As is obvious from this post, one word leads to another. I would encourage Felix, as I do my Grade 7 students, to wonder about words: think about the meaning, look at the structure, make connections between words. Felix and other young students need to become aware that spelling indicates meaning and with that in mind and the fact that words tell stories of the past and give clues as to their relatives, young Felix can begin to wrangle with words and become a word scientist. Oh my goodness. Too much to process. But so much to love, love, love. I will come back to this post frequently in the coming days and weeks to properly savor its wisdom and beauty. Thanks, Word Nerds. Brilliant…as always. And, not coincidentally, I have a few students investigating ‘scientific’ at the moment. Wonderful. Thanks Dan- there’s always so much to uncover with one word and then when we know who coined a word, well you hare off on another trail so there’s another rabbit hole to go down and that inevitably leads to another…and you’ve uncovered a warren of words!!! Enough of my rabbiting on and over working a tired metaphor! !